Bryce Harper and Manny Machado. After a rough start, the Phillies are surging, winning of seven of their last 10 games and currently owning the third-best record in the National League. While it's still very, very early in the season, a young Philadelphia team with some savvy veterans has the looks of being better than expected at this stage of the team's rebuild. Again, it's really early in the season. But the team looks good — maybe even another superstar away from being great? Even after signing Carlos Santana and Jake Arrieta, the financial flexibility the Phillies have for 2019 and beyond is significant. If there is a player they want, they can sign them. 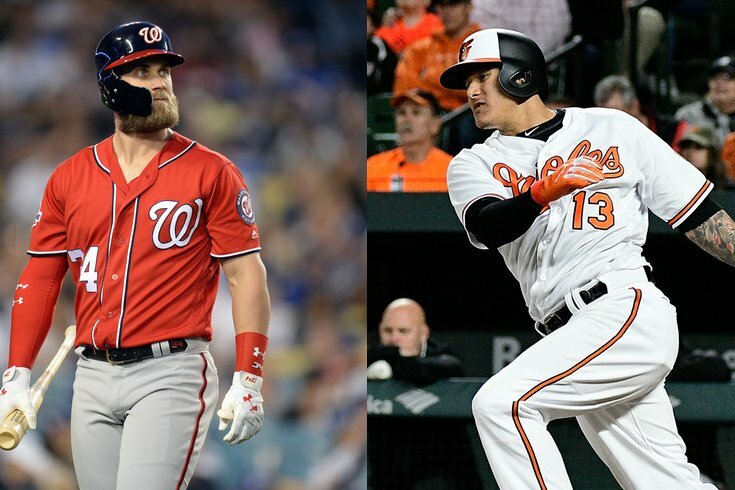 Machado and Harper are the big fish in this free agent crop and I’m going to go on record right now: One of those two players will be playing in Philadelphia next season. “They’ll get one,” one baseball executive opined. Expectations that the Phillies will be big players in the 2019 offseason are nothing new. ESPN analyst Buster Olney said just last month that he would "bet the family farm" that Harper either signs with the Phillies or returns to the Nationals. Earlier in April, baseball insider Jon Heyman pegged the Phillies as the favorite to sign Machado. As Murray noted in his report, Harper and Machado wouldn't just be joining a Phillies team that seems to be turning around — they'd also be playing for a sports city that's experiencing a renaissance, joining other young stars like the Eagles' Carson Wentz and Sixers' Joel Embiid. Murray somehow forgot to mention that we'll also probably have LeBron to make a Philly pitch to Machado and Harper this winter.